Along a boardwalk in the upper lakes area. One of the upper falls. 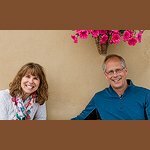 So what is it that makes this place so special? 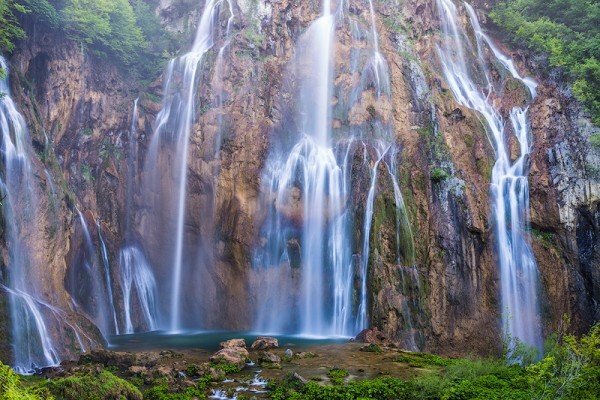 For visitors and especially photographers, Plitvice is a real treat. 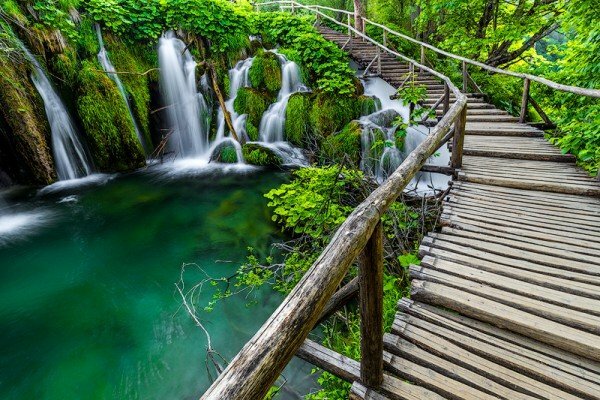 Waterfalls, aqua-green lakes, lush forests, inviting paths and graphically meandering boardwalks over crystal-clear streams provide the ingredients for this visual feast. The park features 16 lakes cascading from 2,087 to 1,650 feet in elevation over a distance of 5 miles. 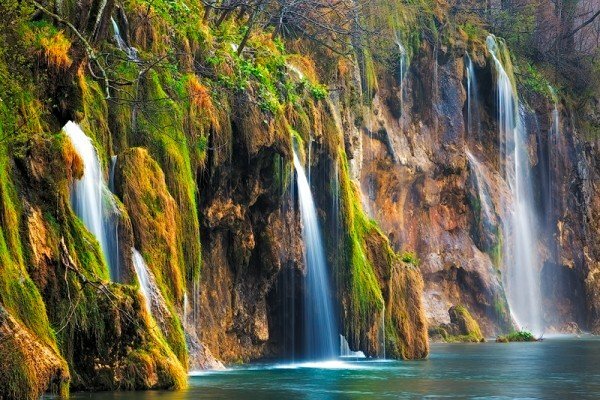 What makes Plitvice so amazing and unique are the naturally formed dams of travertine that separate the lakes. These dams are made from the interaction of moss, algae and bacteria. The plants and bacteria build on top of each other and grow at a rate of 1 cm per year. One of the upper lakes and waterfalls. 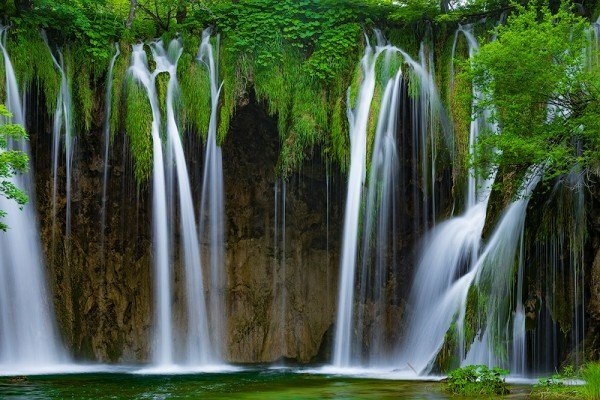 For photographers this provides a plethora of cascading waterfalls between the lakes that become photographic masterpieces with the use of a tripod and a slow shutter speed, ½ of a second or more. This is what gives the moving water that beautiful silky look. 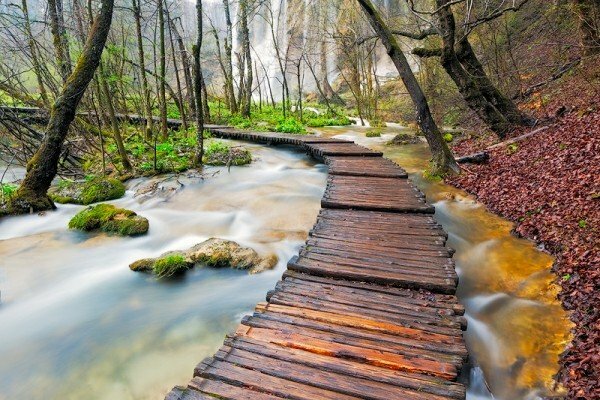 Access to this spectacle is made possible through a wonderful network of paths and boardwalks installed by the Croatian Park Service. On many of the boardwalks you are just a fraction of an inch above the water and it is flowing all around you – truly a magical water world experience. Waterfalls & boardwalks in the lower lakes region. 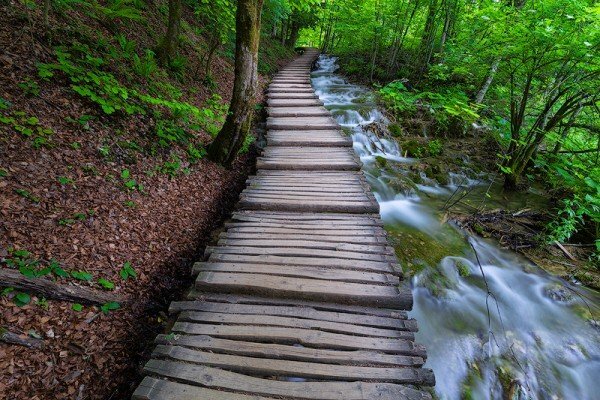 Be prepared for a bit of walking to experience Plitvice optimally. There are two entrances to the park. The largest waterfall in the park. From the P1 entrance it is a short walk to an overlook that provides a stellar view of the lower lakes and largest waterfalls. Getting down to the lakes and falls from this location involves some hiking. We like all areas of the park but are especially fond of the upper lakes accessed from the P2 parking lot. It takes 15 minutes to walk from the parking lot to the entrance of the park. From the entrance you have 3 choices: You can catch the train/bus vehicle that will take you to the top of the lakes and then enjoy a leisurely couple of hours walking along the lakes and streams leading back down to a boat dock just across from the park entrance where you started. A one-minute ferry will take you across. Catching the early morning light before the crowds show up. The second option is to take this same ferry across and walk the previously described route in the opposite direction uphill. We only do this option early in the morning before the train/bus begins to operate. We catch the first boat across at 7 am and within 25 minutes of gradual uphill walking, we arrive at one of the most photogenic areas of the park and, best of all, we have it to ourselves for a couple of hours before the hordes arrive. The third option is to take a boat in the opposite direction toward the P1 entrance. From there you have great access to the lower lakes and waterfalls and you don’t have to hike down from the P1 entrance. Boardwalk & stream in the lower lakes region. 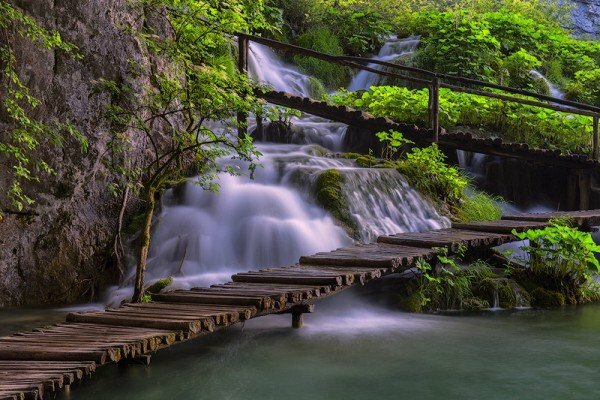 Plitvice is located in central Croatia, about 35 miles inland from the Adriatic Sea. 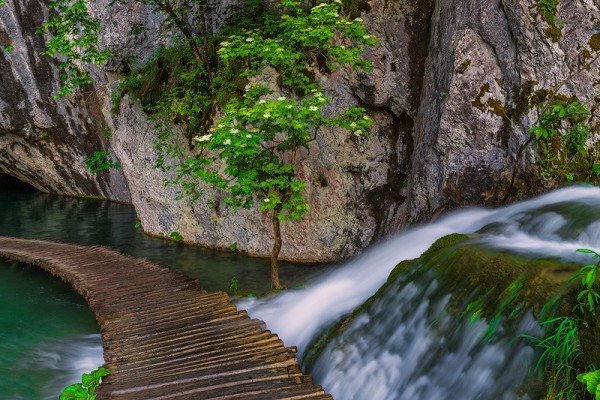 While not necessary, a car is the best method for arriving at Plitvice. Bus transport is available from Zagreb but that limits you to spending the night at one of the over-priced, communist-era hotels within the park boundaries. Our preference is to stay at one of the many very charming and cosy guest houses just outside of the park boundary. Our choice is a family run pension with beautifully remodeled modern rooms and a restaurant featuring local organic produce, meat and fish caught from the river Gacka – one of the cleanest rivers in Europe. The park entrance is a 5 minute drive away. 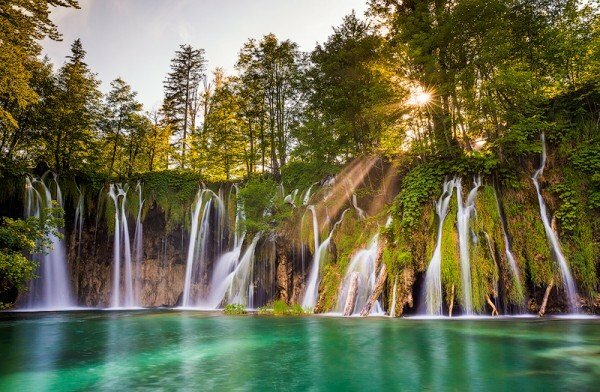 Plitvice Lakes National Park is listed on the Unesco World Heritgage Register and is truly an experience not to be missed if you visit this part of the world. 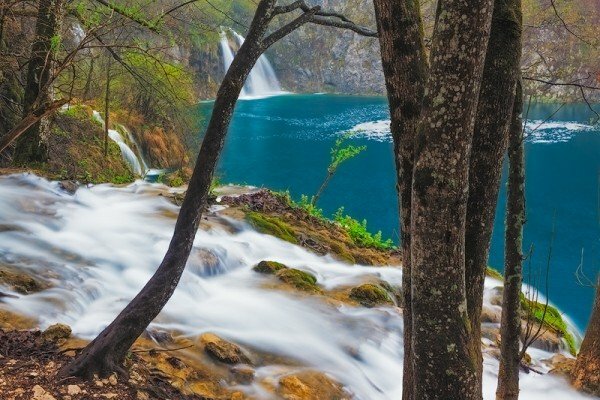 Plitvice is included on our Slovenia/Croatia Photography Tour in May of 2016. We will spend 3 nights here and have 2 full days to photograph this magical National Park full of natural romance.